which is formed from the first letters of ‘eggs made unpalatable’. An emu is a bird native to Australia which is notable for its large size and the fact that it cannot fly (the word to use is flightless). You can read more about the emu here. The outback, of course, is a well-known remote part of Australia and is also a term which can be applied to remote parts of other countries. In a previous post I mentioned that specialist knowledge is sometimes required to tackle clues. The following, from the Daily Telegraph ‘Toughie’ Puzzle No. 1252 dated 4th September 2014, will not mean a lot to young people today who download music from the internet and are unfamiliar with gramophones or record players which were used in the past to play music on discs. Single meaning unmarried is readily understandable, but what, you may ask, has the answer to do with the number 45? The reason is that certain old vinyl records known as ‘singles’ (having a principal song or piece of music on the ‘A side’ and one of lesser commercial appeal on the ‘B side’) revolved on a turntable at 45 revolutions per minute and were also known as 45s. Successful records became ‘hit singles’, an expression still used today. Nowadays ‘single’ has a rather broader meaning than defining marital status. Single can be applied to any adult who is not in a stable relationship with a partner. The many other meanings of this frequently used word are given here. Next Friday is a public holiday in the UK and is known as Good Friday. I will therefore take a short break and will be back on the air after Easter. Your task is to think of a word which can mean both clear and penalty. As usual, the answer is not obvious – and in this case the clue has nothing to do with soccer! Happy puzzling – and Happy Easter. The answer (meaning a painter) is: REMBRANDT. This is another example of a partial anagram. The solution is an anagram of ‘term’ (REMT) put round the outside of the word BRAND. The hint that an anagram was involved was the word ‘new’. The word brand means a particular type (as in ‘which brand of toothpaste do you use?’) and ‘admit’ signals that brand enters into the anagram of term. Not easy! Here are two more clues from Daily Telegraph Crossword Puzzle 27,739 dated 3rd March 2015, which have in common (share) the fact that the solution is obtained by removing the first letter of a totally different word. In this case the hint that a letter has been deleted is the word ‘missing’ – and if a word is ‘missing header’ it is clearly missing the first (head) letter. A synonym for ‘almost’ is ‘nearly’. You can say ‘we are almost there’ or ‘we are nearly there’. The word forward can in some cases mean ‘early’ in the sense that something has taken place earlier than expected. This slightly unusual meaning is often used in a horticultural (gardening) sense – you could say ‘the daffodils are rather forward this year’, meaning they have come out early. For the many meanings of forward see here and note particularly point 3.1. The word ‘forward’ is more frequently used in football (soccer) of course, and by deliberately using the word ‘header’ the crossword setter has cleverly deceived us into thinking the clue has something to do with football! Here again, to solve the clue one needs a good knowledge of authentic, colloquial English, which is why looking at the language through the medium of cryptic clues is so valuable. A slang word for a state of depression is a downer. One might hear ‘I am having a real downer today’, or ‘I’m on a downer’. You can see more examples of the use of downer in the online slang dictionary here. Although downer is also a word for a barbiturate drug, being on a downer does not, or at least not these days, necessarily imply that one has been taking drugs. An owner, of course, is a proprietor: there is always a word in the clue which tell you what the answer means (sometimes more than one word, as we saw in the last post with ‘not all there’). And that is it for this week. A relatively short post for a change. Just think, in the light of all that has been written above, what ‘starters’ could be! The answer is TWITTER, a word which until recently related to the sound birds make. It is now defined additionally in the Oxford online dictionary as ‘to make a posting on the social media website Twitter’. Someone making such a posting is said to tweet. But why is that correct? What has it to do with an idiot and a phrase getting cut short? The reason is that one unkind word for an idiot is a twit. You might hear someone say: ‘you stupid twit!’. And another word for a phrase could be a term (more on this in a moment). If ‘term’ is ‘cut short’ the final letter is removed giving TER. The solution (meaning ‘chat network’) is therefore formed by putting together TWIT and TER. Term can have several meanings (see here) – including a word or phrase used to describe a thing or express a concept. One can speak of a legal term (for example ‘cross examination’ – for a list see here); a mathematical term (for example ‘binomial’ – for a list see here), a term of endearment (such as ‘darling’, ‘angel’, or ‘sweetheart’) and so on. Sad to say, but perhaps not surprisingly, the English language has many insulting terms to describe people who are, or appear to be, stupid, crazy, or not quite right in the head. The word ‘twit’, mentioned earlier, is one – and two others are found in the solutions to the following clues. The answer is ROUND THE BEND. The reason this is correct is that if something is round a bend (in the road for example) you cannot see it (it is out of sight); but in addition round the bend is used to describe someone who is insane (out of his or her mind). You could hear an eccentric person described as ‘completely round the bend’. Or, if the telephone is constantly ringing, you could say: ‘that telephone is driving me round the bend’. It is ‘driving me crazy’; ‘driving me insane’; ‘driving me out of my mind’; or ‘driving me bananas’ (see Never a cross word – 20) could also be used. In fact, the latter possibility is correct and the solution means not all there – another way of saying, in an impolite way, that someone is lacking in mental ability. Scatterbrained is a way of describing someone who is disorganised and lacking in concentration, and not all there can sometimes be used to mean much the same thing. If you really want to read over 200 ways of talking about people who are stupid or crazy you will find a link here. The list has grown in recent years and now includes amusing expressions such as ‘a few sandwiches short of a picnic’, ‘not the sharpest crayon in the box’, and ‘the light’s on but there’s no-one at home’. My favourite is a term used a lot by Americans – ‘out to lunch’! I will leave you with this clue to solve, from Daily Telegraph Puzzle No. 27,739 dated 3rd March 2015. This also includes the word ‘term’ but that is a red herring (misleading). In new term, admit particular type, painter (9). The answer is PHOTO (short for photograph), meaning picture. I told you it was a word you would have heard of. (2) A slang word for exciting is ‘hot’ (hot can have an extraordinarily large number of meanings; see here). (3) The word stocks implies that HOT is inside the letters PO. A shop might stock a particular item, meaning that has it and keeps it inside the shop. ‘Do you stock skiing gloves?’ might elicit the answer: ‘I’m sorry but we don’t stock them.’ Or the response might be: ‘I’m sorry but we don’t have them in stock’. It is amazing how much a simple clue can teach you. Solving cryptic clues sometimes requires a certain specialist (but not too specialist) knowledge. Awareness of the symbols for chemical elements (Cu for copper; Fe for iron; Au for Gold etc.) is one example; knowing abbreviations for US States such as Virginia (VA) or California (CA) is another. Here are a couple of clues from Daily Telegraph Puzzle No. 27,735 (26th February 2015) which require a passing knowledge of art and pop culture respectively. Your first thought should be: ‘is there an anagram involved and is the clue nothing to do with Monet at all?’ However, that does not look likely given that the answer requires 13 letters and there is no obvious word that hints at an anagram. The next thing to ask oneself is: ‘what do I know about Monet’? Probably the first thing that springs to mind is that he was a leading light (prominent figure) in the impressionist school of painting. An entry in Wikipedia is here. So, could the answer be impressionist? It defines ‘Monet among others’ but why are the words ‘artist who copies’ included? Every word in the clue serves a purpose, and surely impressionist painters were (or are) original artists who do not copy others. In fact IMPRESSIONIST is the correct answer but for a reason which requires a good understanding of the English language (that is why studying English through the medium of cryptic clues is so rewarding). The word ‘impressionist’ need not necessarily refer to an artist in the sense of a painter. An impressionist can be an artist in a different sense, namely a performer or entertainer who takes off (copies) well known people, such as politicians, by mimicking their voices and mannerisms. You can find a definition here. An impressionist can therefore be both ‘an artist who copies’ and ‘Monet among others’, which is why the solution is correct. The solution is STANDING STONE, an expression used for a monolith (a large single upright block of stone) dating back to ancient times. Standing stones may be found on their own or as part of a group, the most famous in England being Stonehenge. 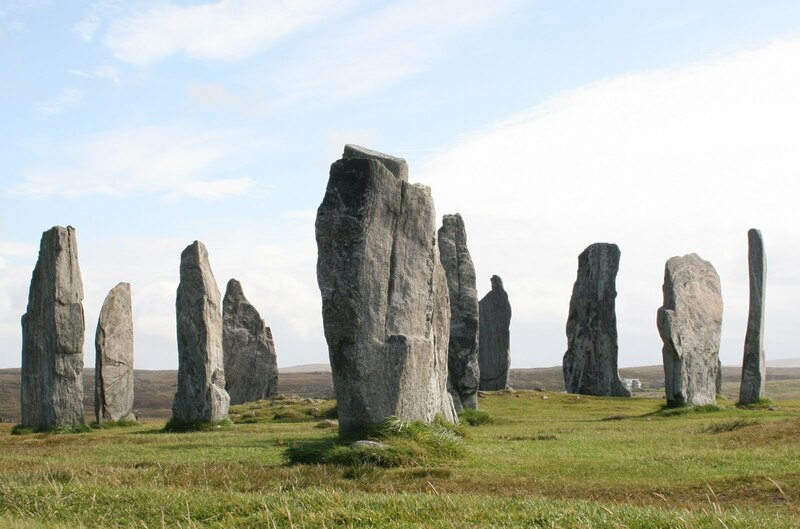 A photo of the standing stones on the Isle of Lewis in Scotland may be seen here. There are various theories about why standing stones were erected, when, and by whom. You can read more in this Wikipedia entry. But why is standing stone correct? It is a monolith, certainly, but why is it not Charlie Watts? Here is where the specialist knowledge comes in. The reason, as all Rolling Stones fans will know, is that Charlie Watts is the group’s drummer – and therefore plays seated, not standing. He can therefore be described as a ‘stone’ (a member of the Rolling Stones) but not a ‘standing’ stone – a very neat pun! Although ‘standing stone’ is a term you are rarely likely to use, never for one moment imagine that crossword clues involve only obscure or out of date English. The reference to the Rolling Stones (unless you consider them to be out of date) should prove that. Indeed, many crossword clues rely on words or meanings that are extremely contemporary (‘hot’, discussed above, is a case in point). Have a go at this yourselves. The answer will appear next week.